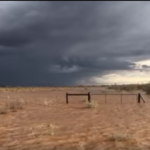 Video: A water pan that formed after heavy rains in the area of Maltahohe. Many Farmers and townspeople from southern Namibia woke up to masses of water dammed up in every hollow spot and dark thunderclouds hanging low on the horizon. Heavy rains fell over large parts in the past 24 hours and the thunderclouds promised even more of the heavenly blessing. At Maltahohe and Karasburg rain measuring in excess of 50 millimetres fell in the span of a single hour and at some places as much as 70 millimetres was measured after the clouds opened up. Certain parts of the south look like large water pans, while some damage occurred during flash floods.